But in the deepest part of winter, it is much too cold for greens from the garden. Even our garden! With a couple of feet of snow on the ground and temps below zero at night, our farm's greens in the hoop house are hibernating until March. But, in the meantime are you forced to go to the grocery store to get salad fixings? No way, friend! You can make a salad out of local veggies, even without the greens component! What is a salad, exactly? It's easy to think that a salad is lettuce, cucumbers, and tomatoes. And most of us probably have thought that way at some point in our lives, or still do. I know I have! There you go! Salads can really be anything you want them to be and can be made out of what you have on hand at the moment! At our house we avoid buying greens (or other produce, besides) from the grocery store. Why would we when we're blessed with such a large larder of stored veggies to choose from? But, we are not starved from having salads, even in these frigid days of winter. In fact, quite the opposite! We have a salad almost every day right through the winter, using what we have on hand from our own home grown veggies! I was making a salad the other day at the kitchen counter, grating away, when a little blond head appeared at my elbow. My little daughter had sided up to check out what was going on. "Are you making kohlslaw, mama?" she sweetly asked. Before I could even answer, she was found reaching up and grabbing some freshly grated kohlrabi out of the bowl and stuffing it into her mouth. And not just once, but Over and Over. "Thank you for making this kohlslaw, mama." amid muffled eating sounds, "it's really good." And she's not usually so complimenting at meal time, so this surprised me! Mmmm.... "Can we make more kohlslaw?" has been the question of the day since we finished that salad recently! Use great tasting ingredients and get creative, leaving behind the narrow definition of salad as lettuce, cukes, and tomatoes! Here are our family's favorite salads for the deepest of winter, when greens from the garden are unattainable and greens from the store are... well, less than exciting. Combine veggies and mix well. Cover with your choice of dressing and let stand at room temperature a couple of hours or marinate overnight in the fridge. As indicated below there are unlimited variations to this recipe. Most recently we've been using beets, red onions, pecans, fresh cranberries, and feta cheese. Give it a try! Boil beets whole until knife pierces through easily. Drain, cool, slip skins off. Refrigerate until ready to make salad (optional). Chop beets and combine with onions and optional ingredients. Pour over dressing of 4 TBLS oil and 1 TBLS vinegar. Add salt and pepper to taste. Serve or refrigerate. 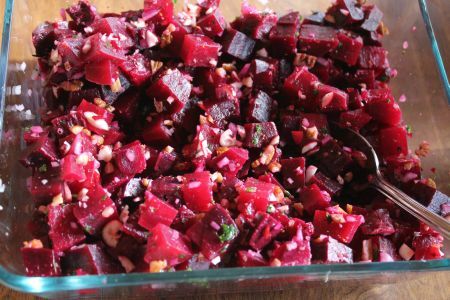 We've also got a couple of other great beet salad recipes on the Beet Page of our Vegetable Gallery of Recipes. If you've never been to the gallery before and you love veggies... you're in for a treat! Go, check it out! Combine veggies in a large bowl. Whisk together the rest of the ingredients into a dressing and pour over veggies. Toss to combine. Check salt and refrigerate until serving. Yes, you can eat beets raw, and try it! With this recipe, you'll find they're delicious in a salad! Combine veggies and raisins. Whisk all other ingredients together into dressing and pour over the veggies. What is your favorite way to make a winter salad? Let me know!